Stress, load, and scalability testing has verified that Siemens Melior can now scale to over 9,000 concurrent users. Sweden, along with Scandinavian countries in general, is recognized worldwide for its advanced healthcare delivery systems, effective adoption of healthcare IT, widespread deployment of electronic medical systems... and care coordination, and its emphasis on improved access to quality healthcare. To achieve these goals, the Nordic region recognizes the need for continuous improvement and reinvestment in supporting technologies. • Implementation of stringent security and data protection regulations. Together, Siemens Melior and Intel deliver a solution that can meet these challenges, preparing Nordic healthcare institutions for the future. 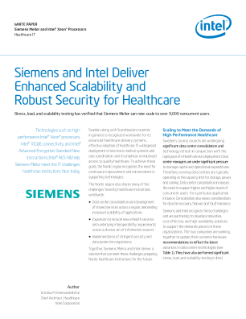 Read the full Siemens and Intel Deliver Enhanced Scalability, Security.